Synopsis: When Travis returns home from a stint in Afghanistan, his parents are splitting up, his brother’s stolen his girlfriend and his car, and he’s haunted by nightmares of his best friend’s death. It’s not until Travis runs into Harper, a girl he’s had a rocky relationship with since middle school, that life actually starts looking up. And as he and Harper see more of each other, he begins to pick his way through the minefield of family problems and post-traumatic stress to the possibility of a life that might resemble normal again. Travis’s dry sense of humor, and incredible sense of honor, make him an irresistible and eminently lovable hero. 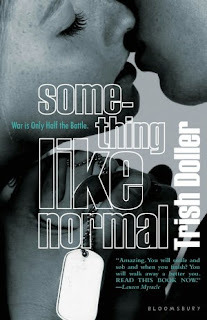 Review: 5 Stars - Something Like Normal is a wonderfully written contemporary title from author Trish Doller. It’s an emotional story with emotionally driven characters. It’s about choices good and bad, scars inside and out and the way that they affect a person and the people around them. Travis… holy cow, what can I say about him? Doller has truly written an amazing male voice/character. I was taken away and so immersed in his life that the time flew buy in the blink of an eye. He’s hurting with some serious emotional scars from his time away at war and then added on top of that, all the issues he returns home to. What he thought he knew about his family has changed while he was away and it’s about him trying to heal, find his place again. There’s romance in this book but that’s not what this is about. Harper has issues with Travis from when they were younger and the two come face to face with them while Travis is home. She’s a pretty amazing female character. So grounded in knowing what she wants, she good right down to her bones. Travis and Harper’s relationship was only a small part of the story in that we get a chance to see how Harper helps Travis deal with his PTSD among other things. Travis has a rocky relationship with his dad, it’s one of the main reasons he joined the Marines. I wasn't a fan of his dad, but watching his relationship with his mom was very emotional. He learns a lot about his mom and what she was going through while he was away and because of this their relationship changes. I loved this part of the story! I’ll admit I felt many emotions while reading. There might have even been a few tears, because that’s what this book is really about the emotions a nineteen year old guy is facing upon returning home after being a solider at war that emotionally scarred him. Doller has without question written a strong story; I can’t see readers not feeling for Travis while reading. He’s true, honest, makes mistakes and hurts like the next person. You are right there with him through the thick of it at this stage of his life. I am grateful that I read this book because the characters felt real to me and in a contemporary title that’s a huge selling point and a HUGE part of what I like or love in a story. All in all, I loved it. I loved everything about it. If I had to choose the one thing that I loved the most it would have to be the voice that Doller gave Travis. Writing a male lead character as strong as this one – I give mad props to Doller for Something Like Normal. I highly recommend this title to anyone who loves a great contemp with characters that’ll leave their mark. Enjoy! I loved reading about this family so much even though they were so messed up. I also found Travis very realistic but he wasn't my kind of character at all-I like a more sensitive or more humorous kind of guy.